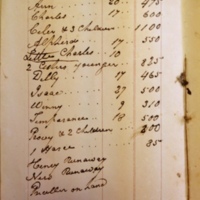 This ledger notes the names, ages and prices for which several slaves were sold by Benjamin Chambers in the slave trading partnership that Chambers and Ruffin started in 1822. This document corresponds with the Purchase of Negroes document from July, 1825 (Item #604) as many of the same slaves are listed with their purchase price on that document. Using these two documents, it becomes apparent that Ruffin and Chambers were making a decent profit from their partnership. Sale of Negroes in Alabama, 1825, Thomas Ruffin Papers, Collection 641, Southern Historical Collection, University of North Carolina at Chapel Hill. Thomas Ruffin, Ledger of Thomas Ruffin, 1825, Civil War Era NC, accessed April 24, 2019, https://cwnc.omeka.chass.ncsu.edu/items/show/603.